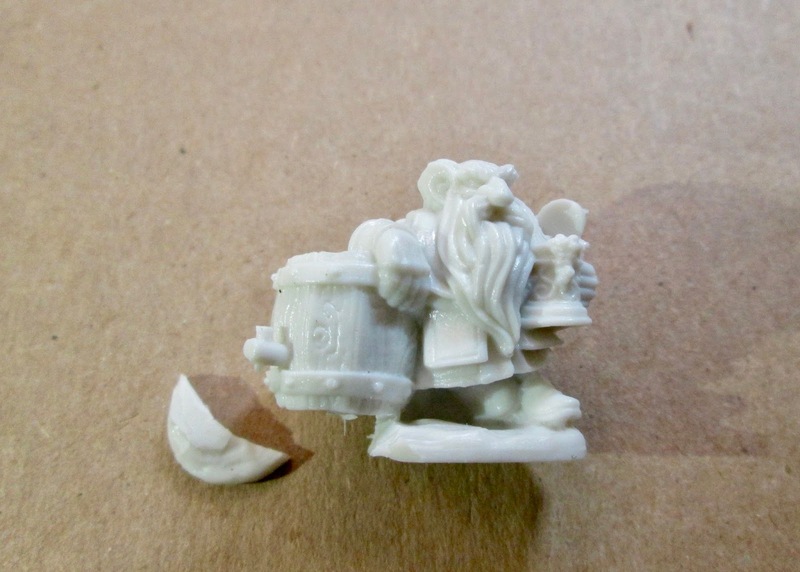 Dwarven Brewer: Bones 3 Figure Conversion | H.A.W.K.S. 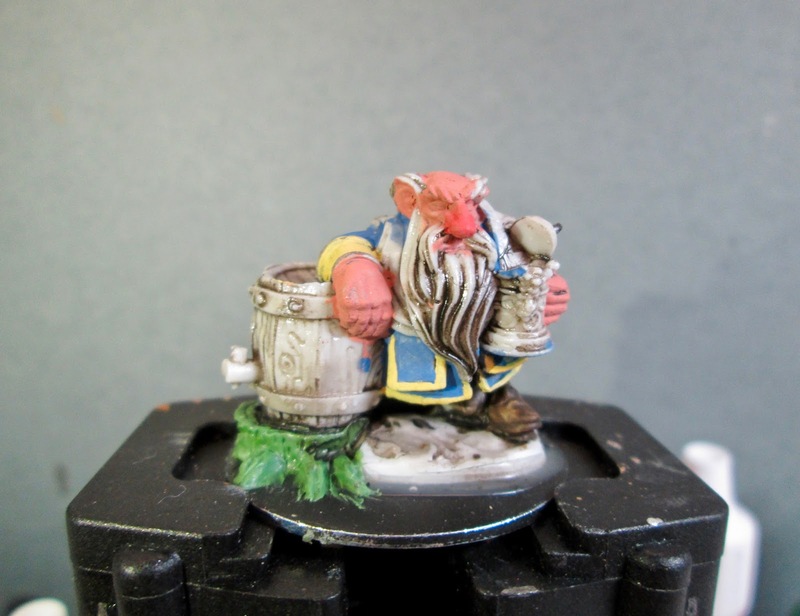 This past week, just for fun, I worked on the Dwarven Brewer from the Bones 3 Townsfolk set. 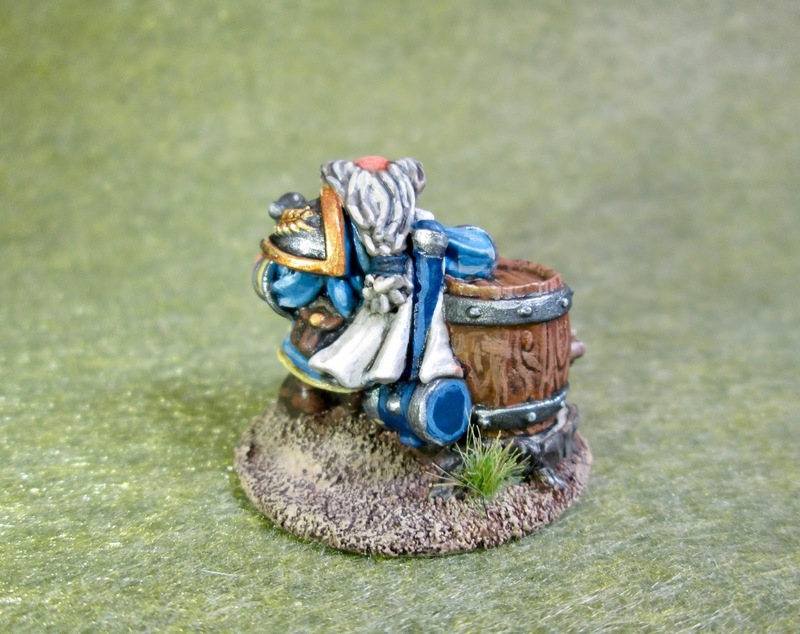 As I looked at the figure, I realized I didn’t like how the barrel seemed precariously balanced on a ridge of the base; and would probably topple over if the brewer lifted his arm. I didn’t think just building up the ground under it would look good, as logically it seemed to me the the barrel would have been set up on something to make getting mugs under the tap easier. So, after soaking the figure in a dish of water with a couple drops of dish-soap added, then giving it a light scrub with a soft toothbrush, and then rinsing and drying it; I cut away a little of the base. I then glued the figure to a black-primed fender washer using Aleene’s Tacky glue. 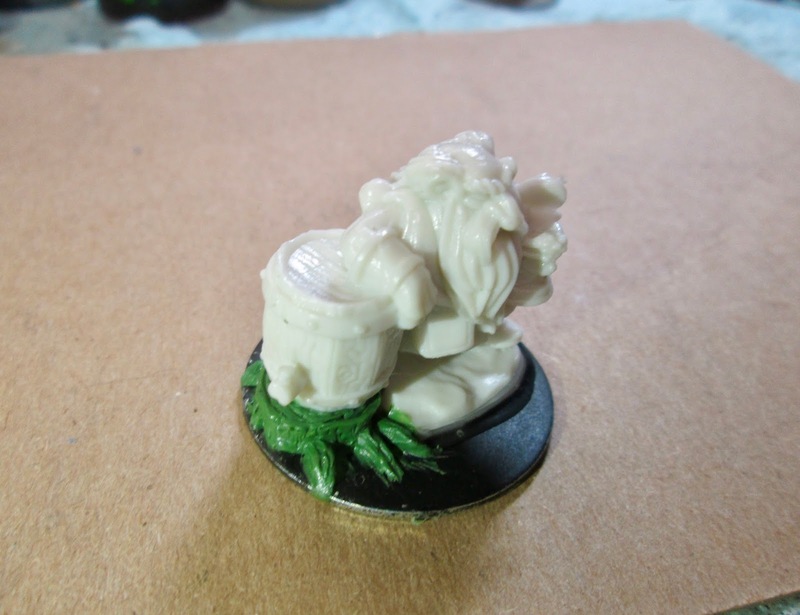 When the glue was dry, I used some greenstuff to sculpt a quick tree trunk under the barrel. Next, I painted the towel over his shoulder with Americana “Dove Grey”, and then did his hammer with Crafter’s Acrylic “Navy Blue”. 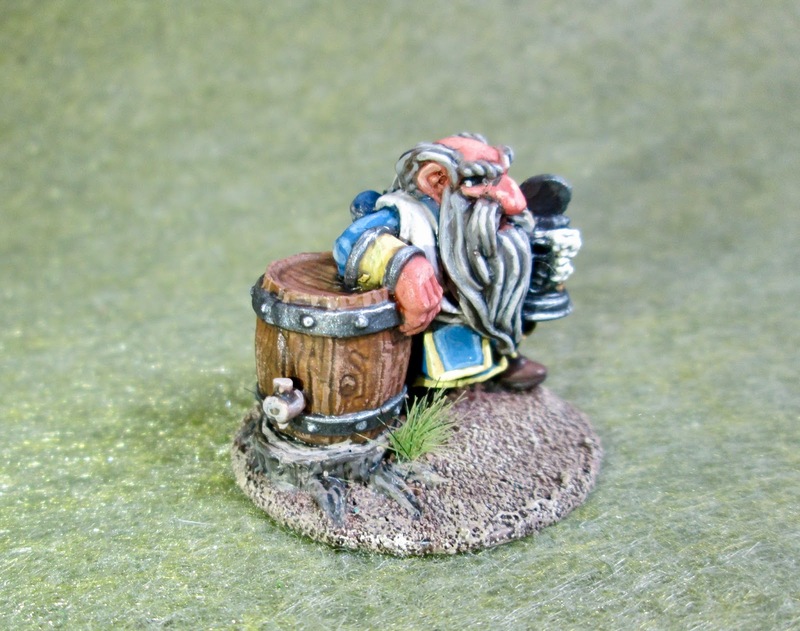 I then painted his hair with Americana “Neutral Grey”, and the beer barrel with Reaper MSP “Turkey Brown”. I then painted the interior wood of the trunk with Folk Art “Barn Wood”, and the bark with Americana “Charcoal Grey” also I did the tap in the barrel with Citadel Foundation Color “Khemri Brown”. 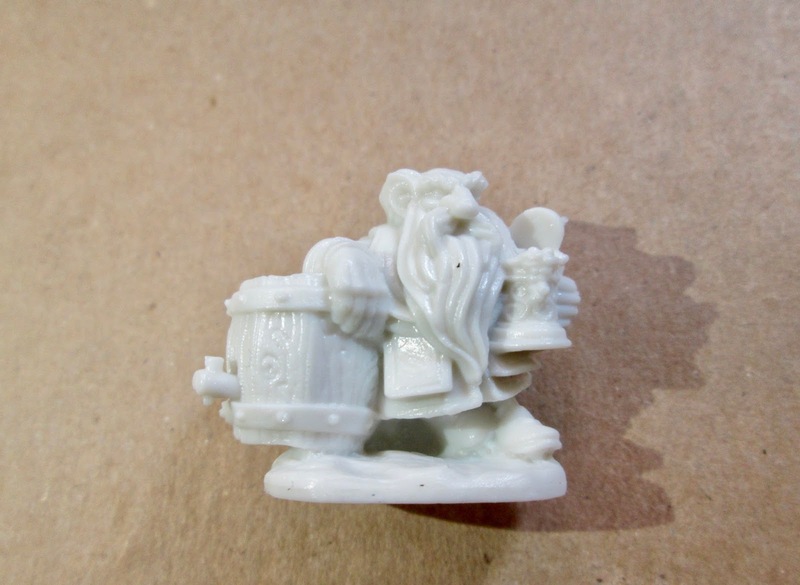 After that, I painted all the parts I planned to make metal, with Americana “Zinc”, and after that, I painted the beer foam with Americana “Antique White”. 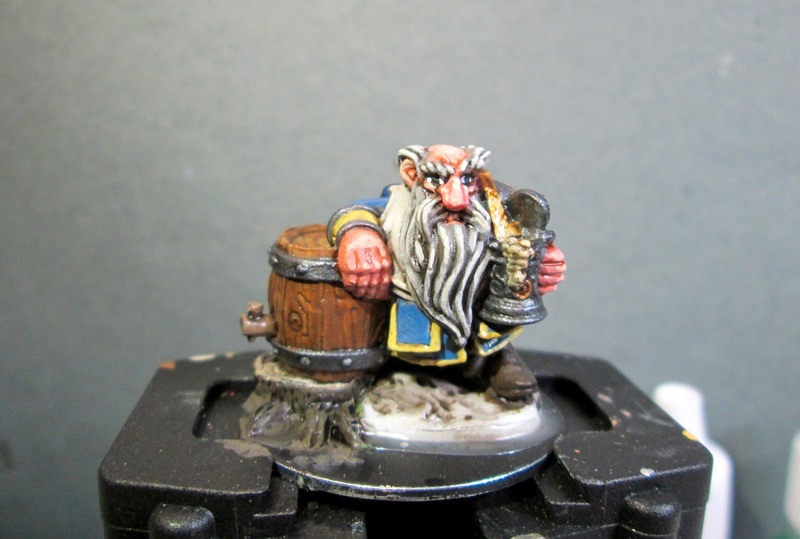 My next step was to go back and paint the beer mug and the bands on the barrel with Accent “Prncely Pewter”, and then his shoulder plate, cuff borders, and the metalwork on the hammer with Folk Art Metallics “Gunmetal Grey”. I then painted the border on his shoulder plate, the barley decoration, and the button on his pouch with Ceramcoat “Bronze”. Then, when everything had a while to dry, I gave the entire figure, except for the face, a wash with Citadel “Nuln Oil” wash. I then went back and applied some Citadel “Reikland Fleshshade” wash to his face. 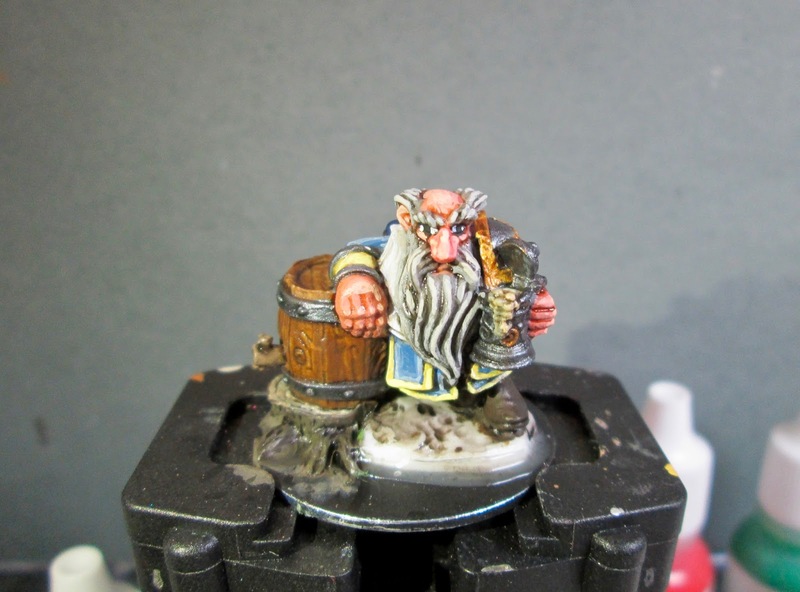 When the wash was dry, I painted his eyes, and then highlighted his skin with a mix of Apple Barrel “Apple Flesh”, and the base “Shading Flesh”. 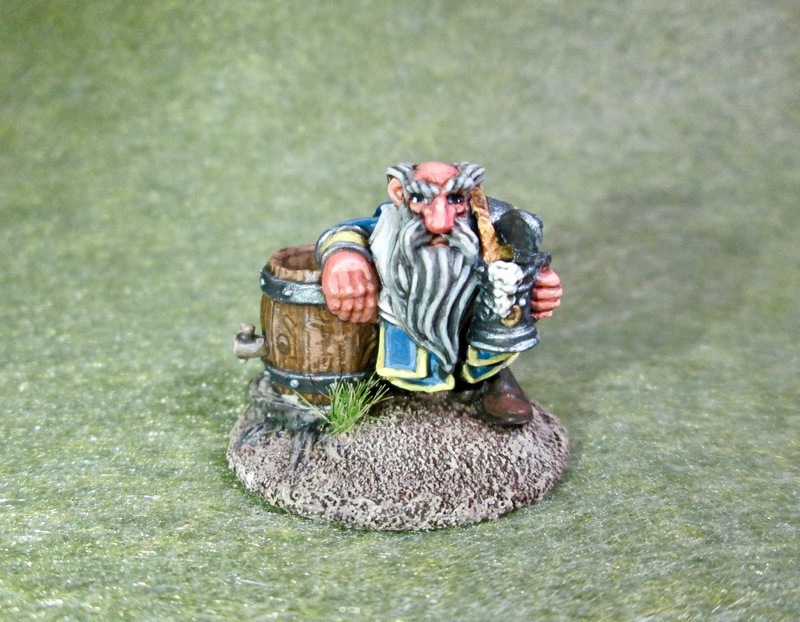 I then highlighted his hair and beard with, first, Crafter’s Acrylic “Strom Cloud Grey”, an the Folk Art “Platinum Grey”. 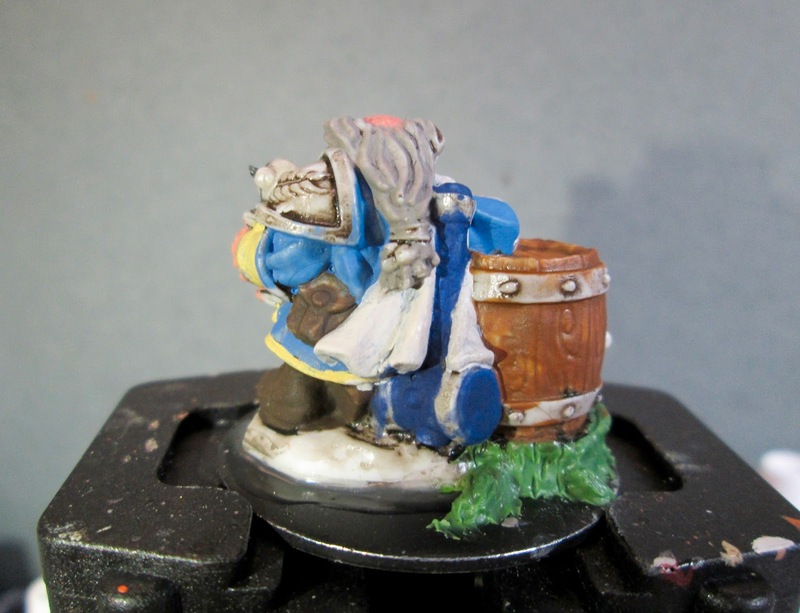 Next, I highlighted his coat with a mix of the “Denim Blue” and some Crafter’s Acrylic “Cool Blue”. I then highlighted the trim and cuffs with a some Crafter’s Acrylic “Daffodil Yellow”, and after that I did the highlights on the towel over his shoulder with a mix of the “Dove Grey” and White. 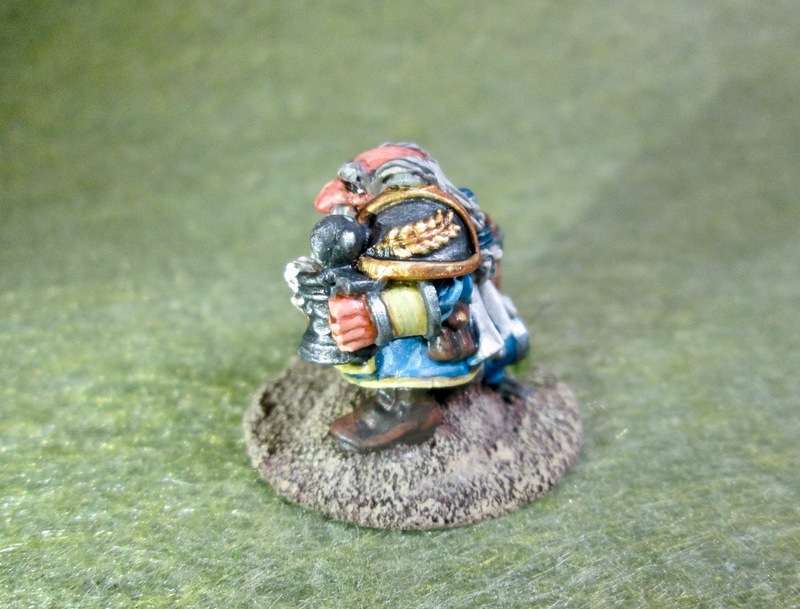 I also highlighted his hammer with a mix of some of the “Navy Blue” and the “Denim Blue”. I then highlighted his shoes and his pouch with Nicole’s “Brown”; and did the beer foam with Americana “Bleached Sand” and White. I next turned to the barrel, highlighting it with Ceramcoat “Territorial Beige”, and the tap with Americana “Mississippi Mud”. After that, I highlighted the inner wood of the trunk with the original “Barn Wood”, and the bark with Americana “Neutral Grey”. Next, I worked on the metal areas, highlighting all the white metal areas with Ceramcoat “Metallic Silver”, and highlighting the areas I painted with the “Bronze” using Ceramcoat “Wedding Gold”. When I was done painting the figure, I used some white glue to glue some fine brown sand to the base. When the sand was dry, I painted it with a thinned coat of Americana “Raw Umber”. When this was dry, I drybrushed the sand with the “Territorial Beige”, and then with some Folk Art “Butter Pecan”; lastly I drybrushed it with a little Crafter’s Acrylic “Light Antique White”. I let the figure dry overnight and the next day I gave him a coat of Americana “DuraClear Matte” varnish. When dry, I glued on some bits of grass tufts. Another overnight dry, and I sprayed it with Testor’s Dullcote". A shot to show how the stump turned out. I really happy with this figure, and I think the stump turned out looking great. My only disappointment is in the highlighting on the hammer; for some reason, in the photos, it looks very harsh and wonky. Looking good! 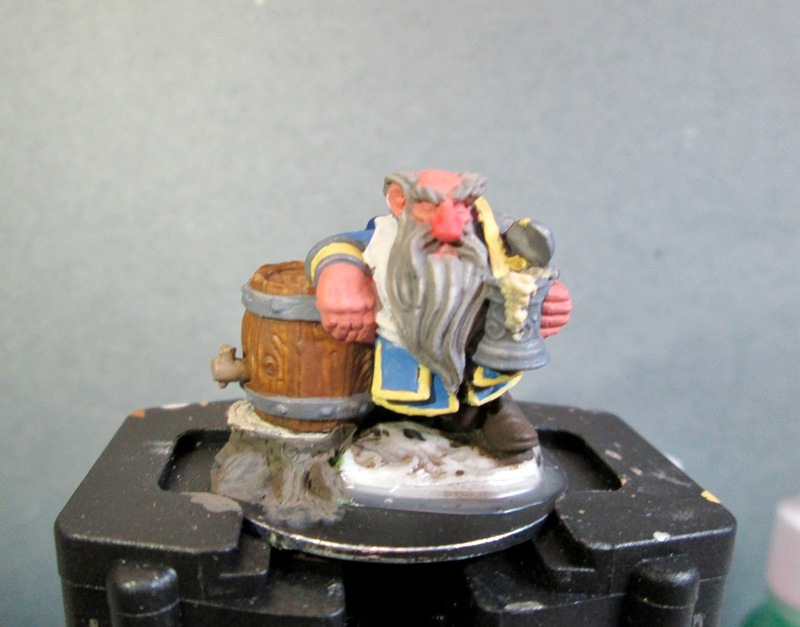 Great idea modifying the base – looks way better! Nice work Chris! Makes me want a beer! You too. Safe travels to Cold Wars! Nice work, that stump was a great addition. I don’t think that’s something I would have ever thought of!